SJ Mercury News slams the lawsuit and the ADF. Update 8/12/05 - It's over!!! Single remaining claim is dropped. 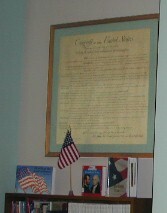 Our constitution hanging in the school library - where it has always been! 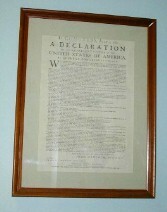 Stevens Creek Elementary has not "banned the Declaration of Independence"
It has been widely and incorrectly reported that the Declaration of Independence has been banned by the principal of Stevens Creek Elementary School, Patricia Vidmar, and the Cupertino Union School District. This started with a press release issued by the Alliance Defense Fund in late November, in connection with a lawsuit being brought by Stephen Williams, a fifth-grade teacher at the school. The assertion has been extensively repeated on the television and in newspapers across the country, and even abroad. As concerned parents at Stevens Creek, we do not have ready access to the media to correct these misrepresentations. This website is our attempt to set the record straight. Misleading and inflammatory reporting in a number of places has subjected school staff and parents to over 3000 hostile phone calls and emails, many of them profane. As a result, the teachers, staff and principal of Stevens Creek Elementary operate under the protection of the Santa Clara County Sheriff's department. We, the Parents, a grassroots organization of over a hundred Stevens Creek parents, invite you to browse our site and discover for yourselves the true face of Stevens Creek Elementary. The declaration of Independence too, of course. We are trying to be completely accurate, truthful and fair in all the content on these pages. If you object to any content for any reason, please let us know. Our thanks to PatriotIcon.org - Getfree patriotic flag icons, images, graphics, and more!